For this tutorial I wanted to combine a few things. I was eager to unpack the package I have received from The Stitch Stash Diva and it revealed yummy, soft, colorful flannel fabric! Flannel fabric is just about the best material (next to fleece) for cold weather. Imagine it’s snowing outside and you can slip on your favorite pj’s made with flannel? Flannel is a multi-purpose material. 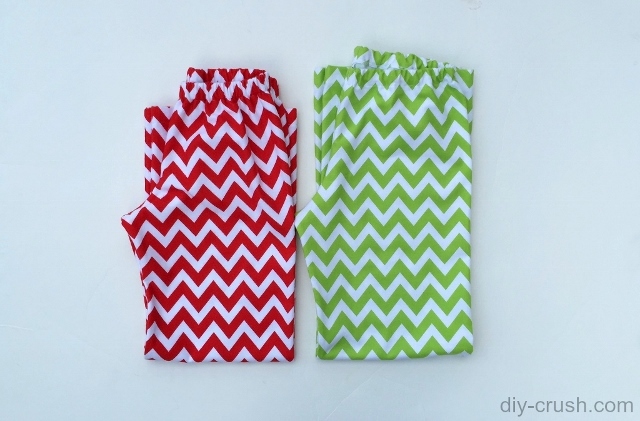 It can be used to make baby bibs and burp clothes or it can function as a jacket liner as well. It’s not only great for pajamas. Further it washes well and especially Riley Blake’s flannel is known for that! Since I love the idea of flannel pj’s I reached to Whimsy Couture’s Jump Around Pants sewing pattern. It’s a great and versatile one and by omitting the ankle elastic it will make a nice, straight pj leg. I traced the size I needed onto a poster roll and cut it out. 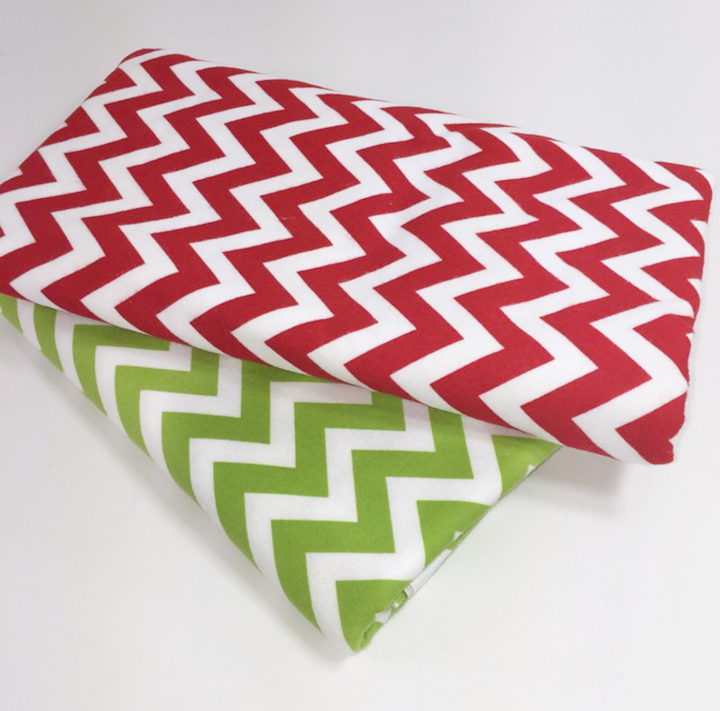 Then I placed the template onto the fabric and made sure the chevron stripes would be nicely even. After I had cut both leg pieces I went ahead and finished the pants. During the entire process I just loved the softness of the flannel! Check out my list of 14 tips when sewing with flannel! This is my light weight heat’n bond which is perfect for a lighter strength and for sewing around the applique’ edges. In order to trace the applique’ shape correctly so that the adhesive side is under the applique’ (especially important for letters! ), flip the shape to be traced upside so that the “S” faces the wrong way. With your pencil carefully draw along the outer edge of the shape. This may take a while to be sure the lines won’t end up squiggely. Take your time! Now cut a square or rectangle just around the shape you just drew. Don’t cut out the exact shape! Once you are done with tracing it’s time to iron the heat transfer to the fabric. 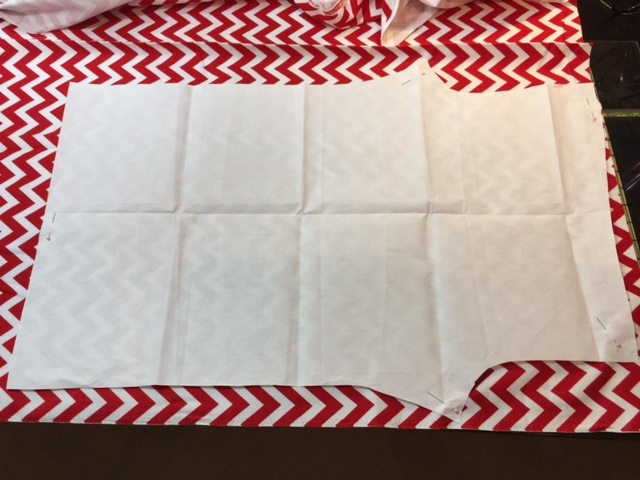 Flip your fabric with right side down and make sure the print direction, if applicable, faces down as well. Place your cut square or rectangle with the rough (adhesive) side facing down and the drawn shape facing up (hey, it’s better when mentioned twice, right? lol) onto your wrong side of the fabric and press with your non-steaming iron according to the adhesive instructions. It is usually about 10-20 seconds on high heat. NOTE: if you are using other fabric than cotton or flannel, follow the heat tolerance of that fabric! Otherwise you might melt the fabric to your iron! 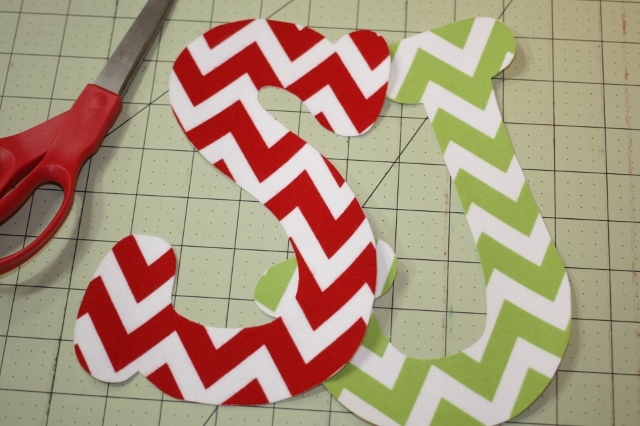 Once your project is cooled off, cut out the shape very carefully with a pair of sharp scissors. NOTE: I don’t use my fabric scissors for anything that has adhesive, so you may want to consider this too. 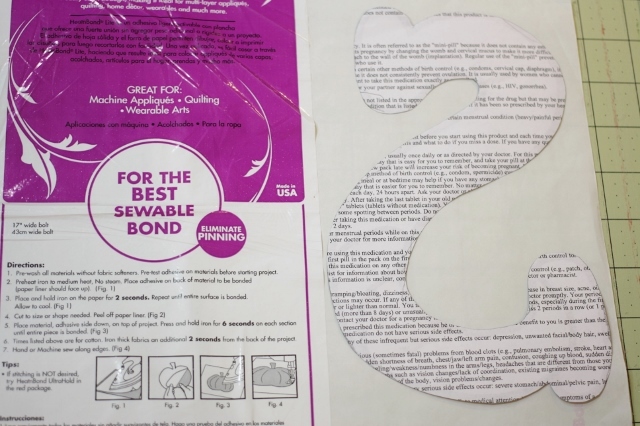 Then peel off the backing of the adhesive. For my project I am using a ready made long sleeve t-shirt from Gildan which is a great quality and pretty thick, so it’s perfect for cold nights. You can also make your own knit t-shirt if you prefer. Set your iron to medium heat and no steam. If your shirt is wrinkled it’s best to steam press it before applying the applique’. Don’t forget to turn off the steam then! Place the applique’ where you want it to appear and press it with the iron according to the heat’n bond instructions or follow mine. Heat press it for 10 seconds at the time. 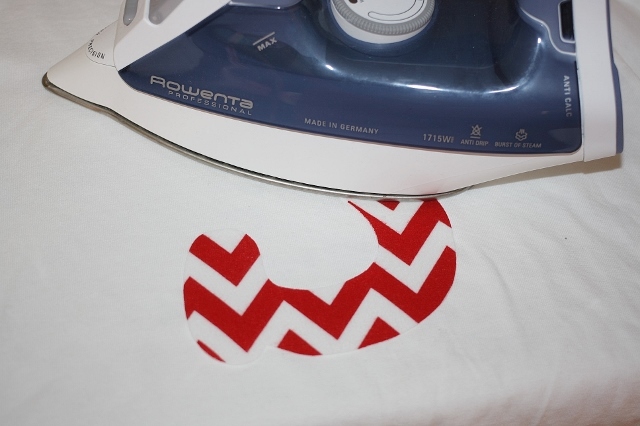 DO NOT move the iron back and forth, keep it still in one spot for those 10 seconds. Lift up the iron and wait about 3 seconds before covering the remaining area. Once you are done with that, go over the entire applique’ one more time but this time you may move the iron as you would with regular fabric. I usually just do a straight stitch along the perimeter of the applique’ with 1/8″ seam allowance. But a wider zigzag stitch or a tight zig zag stitch is also great! Best is to practice on a sample applique’ to see which one you like best. Here is mine: So, my pajama pants (two pairs!!!HA!) are done! A facebook group to share everything in! 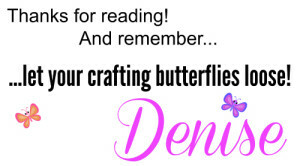 If you enjoy free sewing patterns & tutorials, would you like us to email you when we have a new post up? You can choose what interests you! Then hop on the list by entering your email below! We promise, we only send you 1-2 emails per week! Congrats, I’ve featured your PJ’s on Worthwhile Wednesdays tonight, stop on by and grab your button! Thank you SO much!!! 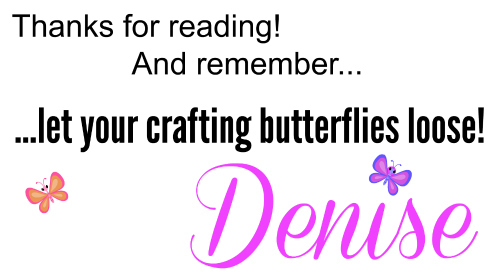 I love your blog and will grab the button in a bit! Happy holidays! 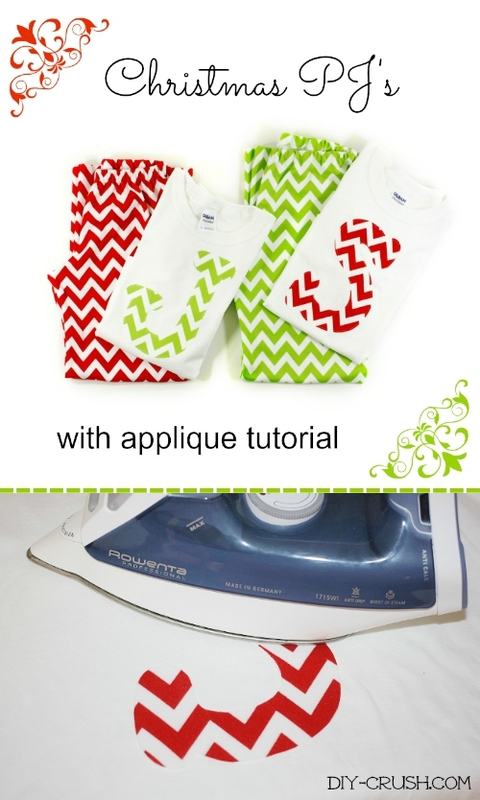 Hi Diane, this is an applique’ tutorial, not a free pajama pattern. If you are looking for a free pajama pattern, I have one in long sleeves in size 9 here and I also have a free short sleeve summer pajama pattern in sizes 10, 11 an 12 here. Both are for kids. Those are the only ones I have at this time. Thanks for checking and good luck with your surgery!